The Rail Vision Team will be holding an open house on Tuesday, March from 4:30 to 7:00PM at the MBTA Board Room 10 Park Plaza, 2nd floor, Boston. This is a good opportunity to understand and give input into the developing vision. 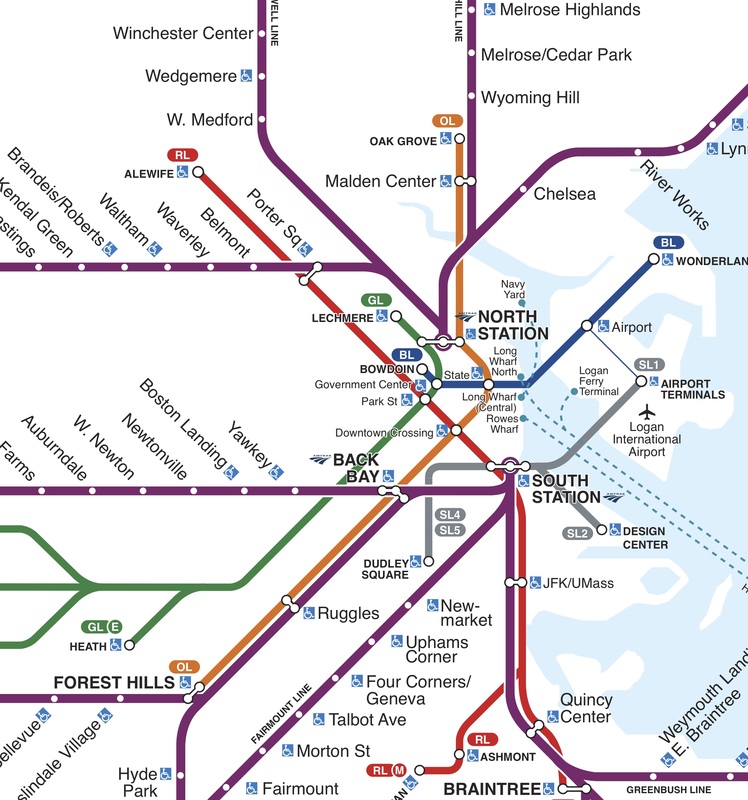 Above: MBTA subway map and inner core of Purple Line commuter rail map. MassDOT is delivering on its promise to give full consideration to the possibility of providing more frequent service to inner core communities on existing commuter rail lines. I posted 18 months ago that MassDOT had found it more difficult than it initially hoped to provide urban rail. MassDOT has, however, commenced a study that should help resolve its plans for urban rail. The study is framed more broadly. It recognizes that there are potentially conflicting goals for our rail system. I represent inner communities near rail lines. Belmont, Watertown, Allston, Brighton, Fenway and Back Bay are all near current commuter rail stops. So, I am focused on the possibility of running frequent urban service for those communities. If frequent enough, this service could offer a meaningful new option for people going downtown. But there are other very legitimate goals for our rail system. Of course, the current model serves an important goal. It provides long distance commuting service to suburban communities. Commuter rail ridership is small compared to subway ridership. All commuter lines taken together handle roughly 130 thousand passengers per week day, less than half the number of passengers that the red line handles. However, since commuter rail takes passengers so far, the passenger-miles traveled on commuter rail are only slightly less than the passenger miles traveled on all the subway lines combined. So, it is arguably the most important part of the MBTA system from the standpoint of reducing greenhouse gas emissions. Another goal for the rail system is to connect our gateway cities to Boston. Rapid express service from Worcester, Lowell and other gateway cities could help relieve our shortage of affordable housing in the Boston area. It could also support more job development within those communities if it allowed reverse commutes for Boston residents. Achieving all of these valid goals may or may not be possible on the tracks we have. Express service can conflict with suburban service that collects commuters from many stops along the line. Inner core urban service can conflict with both suburban and express service. The rail vision study is designed to develop some concrete options and define the necessary tradeoffs between the different approaches. The study will begin by identifying different possible service models. For example, one way to use our tracks would be to simply run more trains all day long along the existing routes. This would be a step towards urban rail, but it would also benefit suburban riders. It would not address the need for express service. Another model would be to run less frequent service outside Route 128 and have transfer stations at 128 where inbound riders would board urban service that runs much more frequently. Other models might blend express, commuter and/or urban service on the same tracks. The consultants running the rail study have been conducting a survey of both U.S. and international rail systems to develop a broad set of alternative models. Working with an advisory group the consultants will choose a smaller set of models to give closer study. The advisory group includes Senator Boncore, the Senate Chair of the Transportation Committee, and, at his invitation, me. The chosen options will then be evaluated using a fully detailed model of our track system to determine which options could actually work with on our current rail network or on feasible extensions of our network. The intention is to develop models that could offer short-term improvements as well as stretch models that might require substantial investment. The study process will be very transparent and I look forward to sharing more information as it unfolds. More information will be posted at willbrownsberger.com and on this official study site. 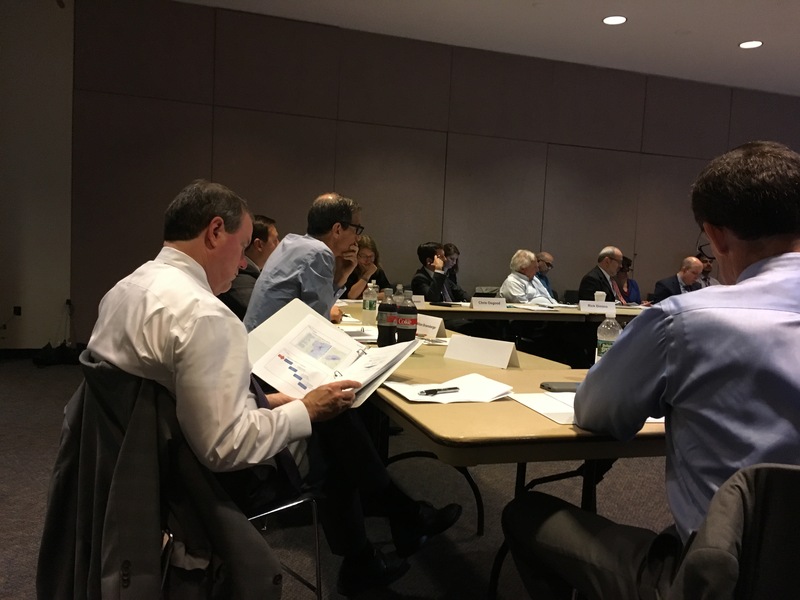 Above: First meeting of the advisory committee to the rail vision study. The Rail Vision Study is about the model for the whole system. Different lines on the system may require different solutions, but the rail vision study will not consider particular stations. It will, however, inform the conversation about particular stations. Secretary Pollack has committed to build West station in Brighton, but the question of when MassDOT will build West Station is a matter of continuing discussion. The Rail Vision Study will speak to the question of what service may be available to West station when.